ILLUSTRATION: NOAH KROESE: New Boise Weekly Illustration! Here's the latest for "The Boise Weekly". 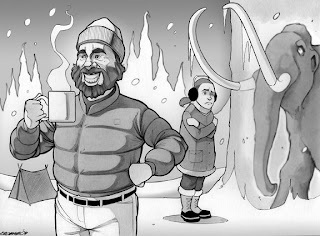 The illustration accompanies a story about snow camping. I'm pretty satisfied with the way this turned out. Invariably, whenever an activity like snow camping is suggested, one person is almost always more enthusiastic than the other. I thought the inclusion of this idea, along with the expression on the mammoth's face, made it in terms of the concept. If I had had more time, I might have changed the mammoth to a frozen family of camping neanderthals. In terms of the style, I'm trying to accomplish a more graphic novel-like aesthetic as opposed to a style closer to what I used in years of political cartooning. This means smaller eyes, less exaggerated features, more detail, and fewer heavy black outlines.